Born and grazed right here in Carnation, WA. Our herd spends the warm months rotating daily to fresh grass, and in the winter months, they eat hay that we cut throughout those plentiful summer months. Our grass-fed beef is what beef should taste like. You can purchase ‘Sampler packages’ which consist of about 12-16lbs of various steaks, roasts and ground. These packages are valued at $150 and are discounted from the regular retail price. They will contain approximately one third each, roasts or slow braising cuts, steaks and ground beef. **Check with us for availability of this option. Join our Beef Interest List! How does buying beef from Jubilee Farm work? We sell our beef by the Quarter, Half or Whole animal. The purchaser places a $250 non-refundable deposit and signs a contract that promises the sale of the beef. We take care of the animal until harvest, and then the meat you have purchased goes to our butcher, who cuts and wraps the beef for you based on your preferences. Your beef is then available for pickup directly from the butcher. What do I receive in a Premium Quarter? Here is a sample list of cuts that you may receive in a typical Premium Quarter. These may vary based on your cut instructions that you give the butcher. You may prefer T-Bones and Porterhouse steaks over NY Strips and Tenderloins. These cuts are derived from the same part of the animal so there are some decisions to be made. You may also decide that you don’t want certain roasts or cuts and would rather have more ground beef. The approximate amount of freezer space needed for a quarter beef is 4 cubic feet which is about the capacity of a standard top freezer/fridge. We charge $5.00 per pound at hanging weight. The hanging weight is determined from the quarter before it has been processed into specific cuts. Quarters vary in weight, but we’ll use a 150 lb. quarter as an example of cost: 150 lbs. at hanging weight would cost $750.00. The butcher charges fees as well. We use Lind’s Custom Meats, and they charge an $85 harvest fee per animal and $0.59/pound at hanging weight for cut and wrap. Each buyer of a quarter pays 25% of the harvest fee. The total cost to the consumer (hanging weight charge plus butchering fees) for a 150 lb. quarter would be $859.75. A limited quantity of single cuts of beef are available at retail cost in our barn during open hours. We also have Sampler Packages available from our USDA processed beef. Valued at $150 these packages typically contain one third each of roasts, steaks and ground beef. The sampler packages are slightly discounted from our regular retail price of the individual cuts. These packages are available during certain times of the year and by appointment for pickup at the farm. Contact us for more info. Is your beef certified organic? We are not certified organic at this time. 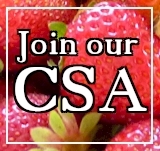 Years ago we did hold the organic certification, but after polling our CSA members, we ultimately decided to drop the official stamp. We do use organic farming practices (we actually use Biodynamic methods which are even stricter than organic!). However, it was decided that the costs of the organic certification outweighed the benefit to our members. During warmer months, our herd grazes freely on fields which are treated only with composted manure. We never use any chemicals, pesticides, or other unnatural products on our land or animals! Thank you for this information 🙂 I had a feeling that was the case! It tends to be for many farms – that darn certification is unreasonably expensive. Thanks again! You could be giving Crowd Cow a run for their money.